We arrived for the summer meeting to be welcomed with coffee and homemade cake – delicious – and still had time for a quick look at the traders, Exeter Sewing Machines had a marvellous display of their machines to try, and Step by Step’s stall looked very attractive with all their beautiful fabrics (quick note to self ‘there will be plenty of time at lunch for all my purchases’). Our first speaker was Janet Williams of Exeter Sewing Machines she was wearing her traditional outfit looking like a model, she told us she had made everything she was wearing including the earrings and then wrapped 2 metres of fabric around her head to show a traditional headdress – this then stayed in place for the rest of the day and looked stunning! She talked to us about millinery and how anyone can look good in a hat. 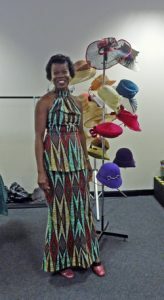 We had a demonstration how a basic hat is made, shown all the different types of hat block and how they are used and all the time she chatted about her life and career. We were also told about the average size of a head and how all blocks are made that size (22 ½ “) so if you have a larger or smaller head than that the hat will be adjusted by the milliner. We were invited to come up after the talk to have our heads measured and there was quite a queue for the ‘measuring chair’ we were also invited to try on all the lovely hats that were on display – I think we all found something that suited us. There was a lovely long lunch break leaving plenty of time to make our purchases, enter the raffles and catch up with friends. Our afternoon speaker was Janice Gunner who talked about her life as a quilter starting with not being able to throw away her dressmaking fabrics. On display was her first log cabin quilt which looked pretty good to me, but as the talk went on and we were shown more beautiful pieces of work I could begin to see where she was going with her liberation of log cabin, cutting strip pieced blocks and turning them to make a new fabric, also how to cut curves to make the block. 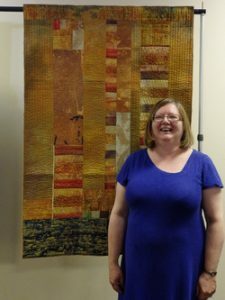 How wonderful to go to a quilt event and be asked to touch and feel her work! And some of them will change colour as they are warmed by your hands! A very inspirational lady and what a marvellous day to chat about on the way home. Thank you SWQ.